Last Updated: March 2, 2018 | Subscribe to our weekly newsletter! It doesn’t matter if you’re a new pool owner or an old hand, shocking your swimming pool might seem a little scary. That’s okay—handling such a high volume of chemicals can make anyone feel jittery. It gets easier with practice and knowledge. Once you understand what pool shock is, why it’s important, and the proper steps to it, the whole process will start to feel pretty routine. That’s good, because shocking your pool on a regular basis is a simple way to prevent stray algae and bacteria from taking root in your water. It also helps keep your pool smelling … well, hopefully like nothing at all. What Is Pool Shock, Anyway? Think back to the last time you walked past a hotel pool. The chemical smell probably knocked your socks off, right? Many people think that unmistakable smell is chlorine, but the odor actually comes from chloramines. It’s also a sign of improperly treated water. Chloramines form when the chlorine in your pool mixes with the ammonia in sweat, oils, and urine (which we’re sure isn’t in your water, though we can’t vouch for the hotel). This is a natural chemical process, basically a byproduct of your chlorine doing its job. In addition to giving your pool a funky smell, too many chloramines can also irritate your skin, eyes, and respiratory system. Shocking your pool just means adding enough chlorine or other chemical to destroy the buildup of chloramines. This process is also called superchlorination. Before we dive into shocking your pool, you first have to understand the difference between free and total chlorine, as well as combined chlorine and breakpoint chlorination. Free Chlorine (FC) is the amount of chlorine actively disinfecting your water. You want your water’s FC level to be between one and four parts per million (ppm) so the chemical can do its job. Combined Chlorine (CC) is the chlorine that’s been used. It’s still in the water, but its sanitizing power is greatly diminished. You want to keep your CC level to less than 0.2 ppm. Total Chlorine (TC) is the sum of FC and CC in your pool. Pool water testing kits If you click this link and make a purchase, we earn a commission at no additional cost to you. can measure the FC and TC of your water. To find the CC of your pool, simply subtract the FC from your TC. Breakpoint Chlorination is when you have enough FC to shatter the molecular bonds of chloramine. You need to add ten times the amount of CC to hit this point. Try to reach the breakpoint every time you shock your pool. Not hitting the breakpoint can result in even more chloramines in your pool, and if the chloramine levels continue to rise unchecked, you may eventually have to partially or even fully replace your water to fix the issue. You generally can’t shock your pool using your regular chlorine tablets, but you do have your choice of products when it comes to pumping up your chlorine levels. Also known as cal hypo, this chemical has been used to disinfect swimming pools and municipal water sources since 1928. It’s probably one of the most inexpensive and convenient ways to shock your pool. Most commercial versions contain between 65 and 75% chlorine. Calcium hypochlorite If you click this link and make a purchase, we earn a commission at no additional cost to you. needs to be dissolved before you add it to your pool. It must be used after dusk. It will be roughly eight hours before you can safely swim again. It adds about 0.8 ppm of calcium to your water for every ppm of FC added, so use caution if your water source already has a high level of calcium. If your water has high calcium content, and you don’t mind paying a little extra, lithium hypochlorite is the way to go. It dissolves much more quickly than calcium hypochlorite, so you can add it directly to your pool without dissolving it beforehand. Commercial versions contain 35% chlorine. It can be toxic to aquatic life (making it a solid algaecide), so you must take care when disposing of recently treated water. 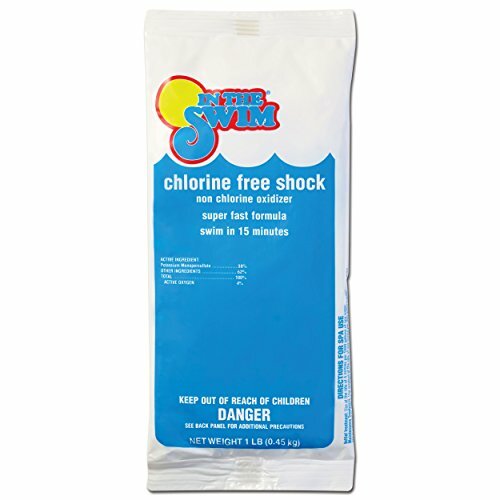 The actual names of this shock chlorine are sodium dichloro-s-triazinetrione or dichloroisocyanuric acid. (Try saying either of those five times fast.) Dichlor shock If you click this link and make a purchase, we earn a commission at no additional cost to you. is much easier to say and even easier to use. Depending on the brand, you may be able to add it directly to your water. It typically contains between 50% and 60% chlorine. You can use it for both regular chlorine doses and shock treatments. You typically don’t have to dissolve it ahead of time. It adds 0.9 ppm of cyanuric acid for every ppm of additional FC. If you’re looking to shock your pool and take a dip soon afterward, this is exactly what you need. 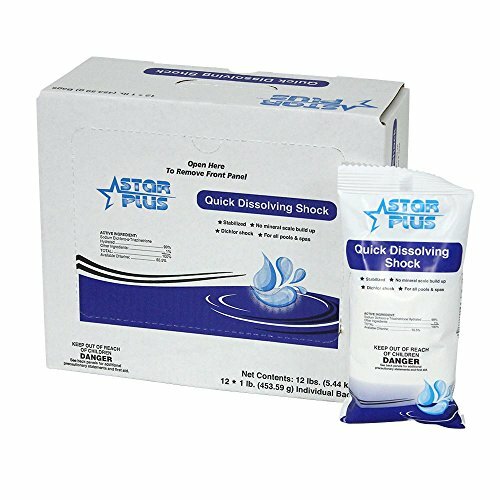 Non-chlorine shock If you click this link and make a purchase, we earn a commission at no additional cost to you. using potassium peroxymonosulfate is a fast, inexpensive pool shock alternative. You can add it directly to your pool water at any time. It will be roughly 15 minutes before you can safely swim again. Because it doesn’t rely on chlorine, it does not function as an algaecide. You might have noticed the chlorine shocks need to be done after the sun has gone down. This is because the sun will burn off unstabilized chlorine. Shocking your pool at night makes sure the chemicals work the way they were meant to. You don’t want to wait for a bad smell or itchy eyes to happen before you shock your pool. We recommend a pool shock once a week, or at least once every other week to properly maintain your water chemistry. The more you use the pool, the more often you should reach for the pool shock. Think of extra shocks as insurance against wayward algae or other contaminants. It’s better to take out any bacteria before it has a chance to affect the quality of your water. You’ve got the chemical knowledge. Now it’s time for practical experience. Superchlorinating your pool is shockingly (sorry, we couldn’t resist) easy once you get the hang of it. Important: Remember, if you’re using chlorinated pool shock, wait until the sun goes down before adding it. 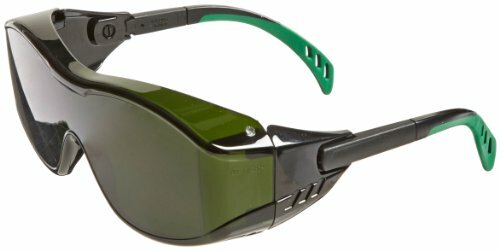 Protective eyewear If you click this link and make a purchase, we earn a commission at no additional cost to you. Protective gloves If you click this link and make a purchase, we earn a commission at no additional cost to you. Water test strips If you click this link and make a purchase, we earn a commission at no additional cost to you. or liquid testing kit If you click this link and make a purchase, we earn a commission at no additional cost to you. 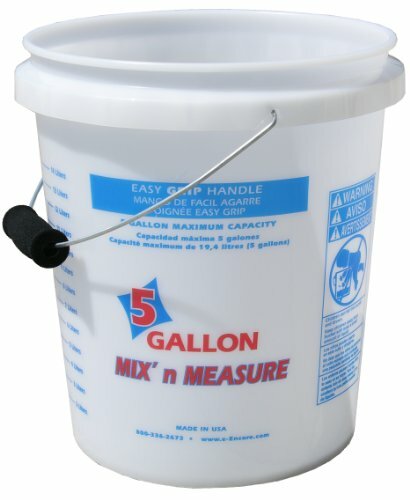 5-gallon bucket If you click this link and make a purchase, we earn a commission at no additional cost to you. Before you start, you’ll need to calculate your pool’s volume. If you don’t already know how much water your pool holds, you can use this pool calculator to figure it out. Pool Volume Calculator Choose the shape of your pool first. Suit up in your protective gear. Test your pool water for FC and TC to determine how much CC is in your pool. This measurement will dictate how much shock you need. Multiply the CC by ten. Subtract the FC from that sum. Find how many ounces of shock will produce a one ppm chemical change in 10,000 gallons of water. Divide your pool volume by 10,000 gallons. Multiply the chemical change by the divided pool volume and the CC/FC difference. Convert the answer into pounds by dividing by 16. The result will be how much pool shock you need to use. If you need to dissolve the shock first, fill your bucket roughly ¾ full with warm water. Otherwise, skip to step six. Add the shock to the bucket and slowly stir until the chemical is dissolved as much as possible. Work in one-pound increments. Skip to step seven. If you do not need to dissolve your shock, count how many containers of shock you need. Add one bag at a time until you reach your calculated breakpoint. 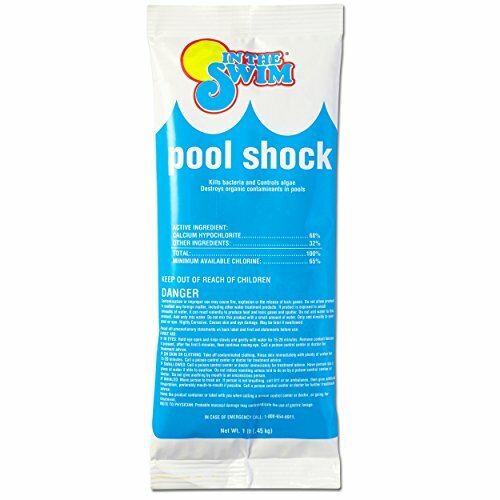 Wait to use your pool based on when you added the shock and the manufacturer’s recommendations. You don’t want to irritate your skin and eyes or bleach your swimsuit. It’s a necessary part of good pool maintenance, but please remember the chemicals you use to shock your pool can be extremely dangerous if they’re mishandled. We’re not exaggerating the danger—improperly stored chlorine can literally explode. Always wear protective gear—especially goggles and gloves—when handling and dissolving chlorine. 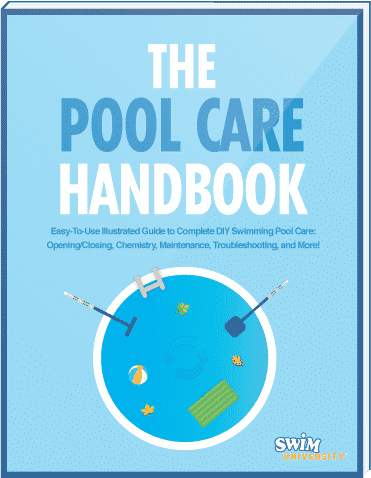 Pool shock, especially calcium hypochlorite, can sometimes release small amounts of chlorine gas. Wearing protective gear can help prevent eye and skin irritation. Do your best to avoid directly breathing from the containers. Exposure to chlorine gas can cause throat and lung irritation. You probably don’t need a dust mask, just try not to breathe too close to the container. Never, ever mix pool shocks. We don’t want you to become a home science experiment gone wrong. Even mixing dry chlorines can cause a volatile reaction. Add each chemical to your pool separately. Do not add shock directly to your water unless instructed to do so. If the package says dissolve before adding, make sure to do just that. Only open one container at a time. If you need to use more than one container of shock, make sure you completely empty out each container before moving on to the next one. Now you know the why, when, and how of shocking your pool. There might be a little math involved, but aren’t occasional brain teasers good for your memory anyway? We’re pretty sure that’s true, but we may have forgotten. Anyway, however you feel about the math, regular pool shocks can prevent more work in the long run. It’s one of the easiest ways to keep bacteria at bay, your water clear, and your pool time fun. Should you put chlorine pucks in your skimmer or use an automatic chlorinators to dispense? We can all agree to at least get rid of the floater.